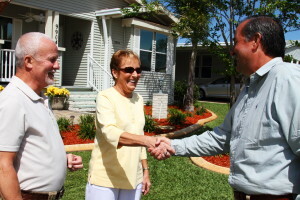 Among the 55 plus communities located near Tampa, Florida, Cypress Lakes stands alone. We provide our residents with premium resort-style retirement living in a safe, gorgeous setting near the sugar-sand beaches, salt-water surf, and renowned theme parks and other attractions that have made the Sunshine State famous. Inside our community, you’ll find all you’d ever want and more in a retirement-age community. Outside our gates, you’ll never be at a loss for things to do and see. Plus, we offer it all with the budget-conscious in mind. Other 55 plus communities in the region may be able to offer one or two of these benefits, but few can offer all three. The amenities that truly set Cypress Lakes apart from other 55+ communities in the Tampa area are our two 18-hole golf courses – making us the perfect community for active adults who enjoy playing this wonderful sport. Our golf courses wind through our 1,000-acre development, and include a driving range, putting green, and fully stocked pro shop that is staffed by an on-site PGA professional. We invite you to call one of our friendly Lifestyle Consultants today to learn more about what separates Cypress Lakes from other 55 plus communities located in the Tampa, FL, area.